Do you play Tai Chi or train Tai Chi Chuan for combat?" The material in this webpage is culled from Selection of Questions and Answers: September 1998 (Part 1). Tai Chi Chuan for play or combat? I've been interested in the workings of Tai Ch'i for a long time. However, most people consider it only a form of therapeutic exercise. Are there any forms of Tai Ch'i with a focus on self-defense? For various reasons, Tai Chi Chuan has been so debased today that an overwhelming majority of those practicing it do not even know that it is a martial art. Interestingly, most of them call it "Tai Chi" instead of "Tai Chi Chuan" which is the propoer term. "Tai Chi". literally meaning "Grand Ultimate", is a Chinese classical term for the cosmos, and it is also used in many other disciplines such as Taoism, feng shui (or the classical study of environmental energy flow), astrology as well as other styles of kungfu. The term "Tai Chi" in Tai Chi Praying Mantis Kungfu, for example, has nothing to do with Tai Chi Chuan. Practicing Tai Chi Chuan is not just a therapeutic exercise, it is an excellent way to promote good health. In other words, you don't have to be sick or want to fight, in oder to enjoy the benefits of Tai Chi Chuan. And good health here is not just physical, but also emotional, mental as well as spiritual (but not religious). Nevertheless, to gain these benefits you have to practice Tai Chi Chuan, not just Tai Chi forms or Tai Chi dance. As if to rub salt to injury, many people do not even practice Tai Chi dance; they "play" it. 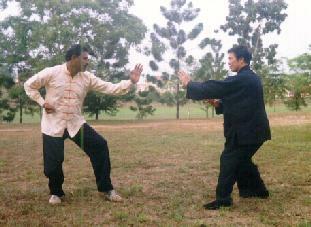 The expression "playing Tai Chi" is not only used in the West, but also among many Chinese in the East. The crucial difference is that when you practice Tai Chi you go over and over again the dancelike movements you have learnt so as to become a good Tai Chi dancer, whereas when you play Tai Chi you nonchalantly perform dancelike Tai Chi movements to while away your time. On the other hand, when you practice Tai Chi Chuan, you train hard, and sometimes enduringly, martial Tai Chi Chuan movements, paying attention to energy and mind, to gain good health, combat efficiency and spiritual joy. This does not necessarily mean that playing Tai Chi is not beneficial. Indeed, for some people, like the elderly who have a lot of time to spare or businessmen and professionals who have a lot of stress, playing Tai Chi is probably more beneficial than training Tai Chi Chuan. Genuine Tai Chi Chuan training is certainly not easy, and for most people is no fun, but for the very few who have the rare oppotunity to learn from real Tai Chi Chuan masters and who are ready to invest time and effort (not merely pay lip service that they will sacrifice everyting to acquire a great art) the benefits are so wonderful that they may not have thought them possible. All forms of Tai Chi Chuan, without a single exception, focus on self-defense, otherwise it cannot be Tai Chi Chuan. The term "Chuan" in Tai Chi Chuan means martial art. All movements in Tai Chi Chuan, including innocent-looking ones like lifting the arms up and bringing the hands back at the start and at the end of a Tai Chi Chuan set, are there for combat, and not for spectator-pleasing or even therapeutic, considerations. Actually, while many people all over the world play or dance Tai Chi, very, very few practice Tai Chi Chuan.